Hemivertebra of the cervical spine is a rare but complex spinal malformation. To our knowledge, only one publication describes excision of an upper–middle cervical (between C2 and C4) hemivertebra. We present our experience with two cases of C3 hemivertebra resection and torticollis correction via a combined anterior–posterior–anterior surgical approach and short segment fixation. Two 12-year-old patients with torticollis due to congenital C3 hemivertebra underwent surgery consisting of combined anterior vertebral body osteotomy, posterior element resection with segment instrumentation and deformity correction, and iliac bone graft reconstruction and fixation via an anterior approach. During the osteotomies, the transverse process accompanied with the vertebral artery was disconnected and freed away from the spinal column. Then the deformity was corrected without touching the vertebral artery, which made the procedure safe and comfortable. The details of this technique are presented. Pre- and postoperative radiographic features, as well as clinical outcomes were evaluated. The treatment process was uneventful. The patients had satisfactory clinical outcomes at a mean of 1.5 years follow-up. Head tilt and chin rotation were corrected completely. Radiographs showed favorable deformity correction, well-balanced coronal and sagittal alignment, and solid bony fusion. 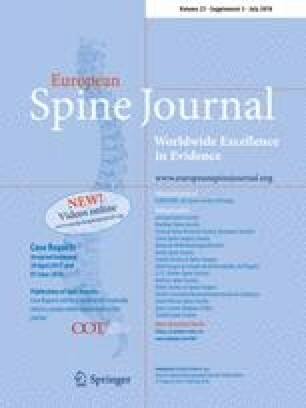 Combined anterior–posterior–anterior hemivertebra resection with short segment instrumentation is a reasonable option for the treatment of congenital cervical hemivertebra, which provided satisfactory deformity correction and good clinical outcomes. This study was approved by the Institutional Review Board of The Second Xiangya Hospital, Central South University. This study has been approved by the ethics and research committee of The Second Xiangya Hospital, Central South University. All the patients signed an informed consent prior to inclusion in this study.